Starkey Hearing Technologies is one of the few American manufacturers of hearing aids, founded in 1967 and based in Eden Prairie, Minnesota. With a long history of innovation, Starkey has introduced several hearing industry firsts: in-the-canal hearing aid and fully programmable invisible hearing aid. 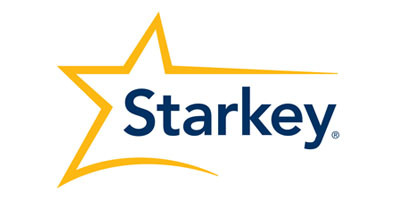 Starkey develops their products with research conducted by the Starkey Hearing Research Center in Berkeley. For their innovative work, Starkey has received the Silver Edison Award (in 2016) for the Halo Made for iPhone hearing aid. They have received previous awards for products such as SoundLens, AMP, and Xino Tinnitus. The Starkey Hearing Foundation upholds Starkey’s mission to change the world through hearing technology. Hearing aids have been fitted, for free, in developing countries such as Malawi, Mozambique, Mexico, and Vietnam to name a few. Additionally, Starkey supports US veterans who return from combat zones with resources and hearing aids through VA benefits. The Muse Made for Life hearing aid is Starkey’s latest innovation. Muse hearing aids are designed for complex listening environments, giving wearers clarity and comfort in noise, high-quality music listening, improved speech recognition, and an ultra-high definition audio experience for every situation. Powered by the new Synergy Processing Platform, Muse hearing aids boast five times the power of previous Starkey platform, processing multiple sounds simultaneously, giving wearers a rich audio experience. To address the challenges of speech recognition, Muse offers Acuity Directionality and Speech Shift, which both function to clarify and protect speech in challenging, noisy places. With wireless connectivity, Muse hearing aids open up a world of accessibility for wearers through connection with smartphones and personal electronic devices. Through wireless connection, the Muse allows wearers to stream music and media from home entertainment systems directly to the hearing aid. Utilizing SurfLink Mobile 2 and SurfLink accessories, the Muse enables wearers to turn their phones into assistive listening devices if they require an extra boost. This feature uses the phones microphone to pick up sounds, which are then amplified and streamed to the Muse. Designed to anticipate and adapt to new sounds, Muse hearing aids provide speedy transitions in sonic landscapes and assists the brain’s recognition of new sounds. The Music Memory function is designed for musicians and music lovers, with the ability to facilitate a high-definition, refined listening experience. Sound comfort technology protects sounds and eliminates distortion, for both soft and loud sounds. For those who experience the symptoms of tinnitus, the Muse is equipped with Multiflex Tinnitus Technology, a sound therapy program to provide relief from the frustrating symptoms of tinnitus. Muse hearing aids are available in the following standard and customizable styles: completely-in-canal, in-the-canal, in-the-ear, receiver-in-canal, and behind-the-ear. The Muse micro receiver-in-canal model is equipped with a telecoil. The Muse CROS is available for those who experience single-sided deafness. The Halo Made for iPhone hearing aid received the Silver Edison Award in 2015. Now in its second generation, the Halo 2 updates and adds to the innovations found in the original Halo. The Halo 2 is designed specifically to connect wearers to their smartphones and other personal electronic devices. As such, it utilizes the TruLink Hearing Control App to allow wearers the option to make adjustments to features and volume, stream phone calls, music and other media directly to their hearing aids, and activate the GPS geo-tagging feature. Halo 2 opens up much accessibility for the wearer, and the GPS geo-tagging feature provides much in terms of seamless listening. As you make your way through different environments, you make small adjustments in volume and program features. The Halo 2 will log your preferences in specific spaces, using geo-tagging, and when you return to these places, the GPS geo-tagging feature will automatically adjust to your previously saved settings. 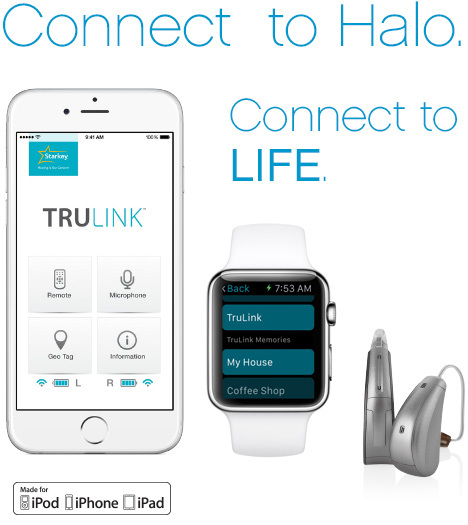 In challenging noise situations, the Halo 2 and TruLink App give wearers an extra boost, but turning the iPhone into an assistive listening device. The microphone captures sound, which are amplified by the app and then streamed directly to the Halo 2. Starkey’s Halo 2 is available in receiver-in-canal (RIC) and behind-the-ear (BTE) styles. The Starkey Z Series is a family of wireless hearing aids, powered by BluWave 4.0 processing platform. The Z Series emphasizes speech recognition in noisy listening environments and comfortable listening experiences in diverse environments. With Binaural Spatial Mapping and Voice IQ, Z Series hearing aids simulate natural binaural hearing to give wearers a full spectrum of sounds and excellent speech recognition. For those who experience tinnitus, Z Series RIC hearing aids offer Multiflex Tinnitus Technology. With HydraShield2 coating, Z Series hearing aids are protected from the elements, dust, debris, wax and oils. Z Series hearing aids are available in BTE, RIC, completely-in-canal, in-the-canal, and in-the-ear styles. In addition to these hearing aids, Starkey offer a large catalog of customizable products, available in the following styles: invisible, receiver-in-canal, completely-in-canal, behind-the-ear, and in-the-ear. Starkey also offers invisible in-the-ear amplifiers for new comers to hearing devices.